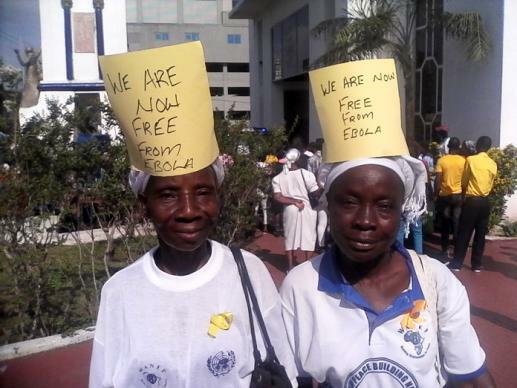 These women were among the Liberians celebrating and giving thanks in Monrovia on May 11 after the announcement by the World Health Organization that Liberia is free of the Ebola virus. Ellen Johnson Sirleaf, president of Liberia and a United Methodist, led an array of government officials and foreign dignitaries in a May 11 service offering thanks for the World Health Organization’s declaration that Liberia is free of the Ebola virus. Sirleaf said Liberia would be offering to help two other West African countries, Sierra Leone and Guinea, as they continue to fight the disease. “Until our neighbors are totally free, we are not free,” Sirleaf warned. She also called on Liberians to remain vigilant in using public health measures that ultimately helped contain Ebola in their country. “Let us do those simple things like washing hands, reporting when someone is sick, and making sure that there is safe and dignify burial,” she said. And while the virus may be gone, Liberia will be struggling with the effects of the outbreak for a long time, including reinstating routine vaccinations of children, suspended during the outbreak for lack of resources. The United Nations announced the launch of a massive effort to vaccinate children against measles and polio. You can donate to the Bishop Judith Craig Children Village through Advance #11820A. The thanksgiving service was held at Centennial Memorial Pavilion in central Monrovia. It celebrated the end of 14 months of battling Ebola, including an excruciating wait of more than a month for the expected WHO declaration, which came on May 9. Tolbert Nyenswah, Liberia’s deputy minister of health and head of the ministry’s Ebola incident management team, announced that the work he had begun last August was over. Nyenswah is also a United Methodist. “With my team of capable Liberian professionals we have conquered the deadly Ebola virus and can now deal with any Ebola virus whether it is of animal origin or human person to person transmission,” he said. Nyenswah credited the Liberian people and the international community as crucial partners in the effort to stop the disease in Liberia. The Rev. Cooper Mondolo, superintendent of the Weala District, was not among the United Methodist clergy present to give thanks, but he shared in the sentiment. In an interview, he also recalled the many lost lives. The toll included 189 health care workers. The Rev. Karyidia Gartor, superintendent of the Kakata-Farmington River District, elaborated on the disease’s costs. “It left behind . . . 26 orphans who now live with relations who cannot afford to take care of them properly,” the clergyman lamented. Gartor said his district, in partnership with the Iroquois River District of the Illinois Great River Conference, is making sure that children are in school and getting at least the basic help they need. Already eight of the children have been placed in the Bishop Judith Craig Children Village while the rest are with family members who are getting help from the district. The village cares for orphaned children. “The Ebola virus has awakened in us, the people of the Kakata-Farmington River District, the spirit of cooperation,” Gartor said. The Rev. George Wilson, director of Connectional Ministries for the Liberia conference, said The United Methodist Church in Liberia has not decided whether to have its own thanksgiving service. He echoed the president’s call to remain vigilant. “As someone who presided over the UMC Liberia Task Force, I will prefer that all of the preventive measures that were practiced during the crisis should now be regarded as standard practices for the Liberian people,” Wilson said. Liberia was seeing 300 to 400 new Ebola cases a week last August and September. The country has no cases currently, and the country’s last death from the disease occurred March 27. The WHO statement credited Sirleaf Johnson’s strong leadership with helping end the outbreak. “Her swift and sometimes tough decisions, frequent public communications, and presence at outbreak sites were expressions of this leadership,” the statement said.